The usually dim Comet 17P Holmes blazes away in this Oct. 25 image from the observatory (Harvard MPC H45) at Petit Jean Mountain in Arkansas. The comet continued to brighten overnight and reached magnitude 2.0, approaching the brilliance of some of the brightest stars. A comet that suddenly brightened earlier this week has astronomers around the globe fascinated. And the show could go on for some time. Comet Holmes, discovered in 1892, had in recent years been visible only through telescopes until a dramatic outburst made it visible to the naked eye. In fewer than 24 hours, it brightened by a factor of nearly 400,000. It has now brightened by a factor of a million times what it was before the outburst, a change "absolutely unprecedented in the annals of cometary astronomy," said Joe Rao, SPACE.com's Skywatching Columnist. The comet is now rivaling some of the brighter stars in the sky. Anyone with a map should be able to spot it now. But Comet Holmes lacks a tail, so it's more like a fuzzy, yellow star, observers report. The view is improved with a small telescope. "This is a terrific outburst," said Brian Marsden, director emeritus of the Minor Planet Center, which tracks known comets and asteroids. "And since it doesn't have a tail right now, some observers have confused it with a nova. We've had at least two reports of a new star." The comet could fade in a matter of days or weeks, according to a statement from the Harvard-Smithsonian Center for Astrophysics. Comet expert John Bortle expects the comet to continue as a naked-eye object for the next few weeks as it dims gradually. Bortle said the coma, or fuzzy head of the comet, could expand as weeks go by. The coma could reach the apparent size of the moon in the sky, he said. The comet is located among the stars of the constellation Perseus, which is about halfway up in the northeast sky in the evening. Perseus is almost directly overhead by around 2 a.m. local daylight time and remains well up in the northwest at dawn. "The comet was plainly visible, disturbing the normal pattern of stars that make up Perseus," Rao said after observiing it last night. The comet orbits the Sun once every seven years at a distance of about 200 million miles (compared to Earth's 93-million-mile orbit). It was re-observed in 1899 and 1906 before being lost for nearly six decades. 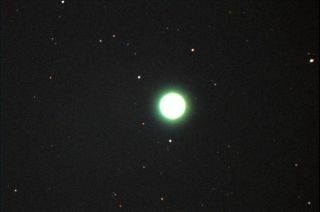 Based on a prediction by Marsden, the comet was found again in 1964. "Since then, it's been behaving well—until now," Marsden said. Astronomers don't know why the outburst occurred.